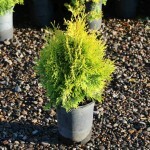 This is an evergreen with a tight, upright pyramidal habit with bright yellow-gold foliage. The color holds well year round. This is a sport of 'Emerald Green'. It grows in full sun to part shade, in an average, well-drained soil. The best color is in full sun. 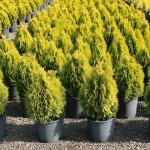 Use as a specimen or accent in the landscape. PP 21,967.